The following comments are being provided in response to Proposed Revision of 6 NYCRR Part 200, General Provisions and Proposed Part 247, Outdoor Wood Boilers (“OWBs”). 1. The Proposal will severely damage the economy of the State of New York by killing jobs, and by increasing heating costs by over 400 percent for many businesses and homeowners. 2. The Proposal will expose the DEC and the State to a potentially enormous legal liability associated with deaths and injuries resulting from carbon monoxide poisoning and house fires. 3. The Proposal will dramatically increase the emissions of greenhouse gasses. 4. 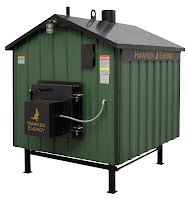 The State consists of largely rural areas where outdoor wood boilers (OWB) do not impact anyone. Broad regulation of OWB throughout the entire State would be overly burdensome to citizens in most areas of the State. Therefore, any necessary regulation should be established at the local municipal level in densely populated areas only. 5. Establishing a stack height, phase out and seasonal operating limitations pertaining to existing OWB is ridiculous and unconstitutional. 6. To require an OWB owner to replace his legacy OWB or permanently remove his OWB by 2015 and no later than 2020 is unconstitutional and will be challenged in the courts. The proposed rulemaking requirements would require a Phase 2 models which are more costly than traditional OWBs. Note the table below that compares a Standard OWB to a “Cleaner Unit” – this table shows that the “Cleaner Unit” costs 72 percent more, AND it produces less than HALF the amount of heat! Result of this Regulation? NY CITIZENS WILL BE BURDENED WITH SUCH HIGH COSTS FOR THESE “CLEANER UNITS” THAT THEY WILL LIKELY NOT BE ABLE TO AFFORD THEM. As a result, more fossil fuels will be burned in the State, thus creating more greenhouse gas emissions. Fossil fuel costs are much higher than biomass (wood) cost. Our State consists primarily of heavily-wooded, rural areas. It makes no sense to burden the citizens of our entire State with a rule that really only applies to a few densely populated areas that comprise a tiny fraction of our State. The proposed rulemaking attempts to convince the reader that the cost of becoming compliant with their new stack height requirements would be minimal. This is completely false. An average cost for a homeowner to make this modification to an existing OWB would be $815.00. Per Btu, wood is much less expensive than fossil fuels – at current prices, natural gas is three times the cost of wood, propane is five times the cost of wood, and electricity is seven times the cost of wood . Does the NYSDEC really wish to subject the citizens of New York to the high cost such expensive fossil fuels, or the high cost and low output of EPA-approved devices? The high cost of energy for home heating has financially crippled many homeowners nationwide. The State of New York should be looking for ways to provide its citizens a way to stay warm in their homes, without facing financial disaster. The harvesting and burning of wood is an important economic factor in New York.. It reduces our dependence on foreign energy companies and it supports our local economy. There is no billion dollar wood fuel utility that will profit from wood burning or multinational corporations involved in the wood heat business. Most businesses that supply furnaces are small manufacturers and retailers. Local workers who chop firewood and chimney sweeps who service wood-heating systems get the benefit of local dollars. Hawken Energy has 13 Authorized Factory Representatives in the State of New York who support their families at least in part by selling and installing Hawken OWB. Many of these Reps have employees working for them as well, all of whom would face the possibility of losing their livelihood should the proposed Regulation be adopted. Does the NYSDEC really want to eliminate more jobs in the state? Result of Regulation? New York will lose many jobs to big foreign oil companies. See Sections 1 above. Note that given the extremely high cost of “EPA-approved” devices, very few units are being sold. One company that sold only EPA-approved devices, Greenwood Technologies, has gone bankrupt and is currently liquidating its assets. Again, these units cost much more – in some cases they are twice the cost of standard OWB – and they typically produce less than half the BTU output. Therefore their excessive cost would overly burden citizens of the State. The stack height requirement would also overly burden citizens of the State with very high compliance costs. See Section 2 above. Within 10 years, experts project the world oil demand will exceed production capacity by 20 million barrels per day. This will result in astronomical fuel prices to level the supply/demand curve. NY homeowners will be forced to find and pursue alternative heating methods; low-cost wood and other biomass fuels will enable NY homeowners to heat their homes without becoming financially crippled, unless your proposed Regulation is adopted. Result of Regulation? Such Regulation, if adopted without the foresight of expected future fossil fuel energy costs, will damage the NY economy, as home heating costs rise. The Proposal Will Expose the NYSDEC and the State To a Potentially Enormous Legal Liability Associated with Deaths and Injuries Resulting from Carbon Monoxide Poisoning and House Fires. Given the cost of this proposed rulemaking on citizens of our State, many citizens will not be able to afford these high regulatory costs and will be forced to use indoor-fired heating appliances. Such indoor-fired heating appliances are dangerous – such dangers include, among other things, serious injury and even death from carbon monoxide poisoning and house fires. Result of Regulation? The high cost of compliance with this Regulation will lead businesses and homeowners away from using wood as a fuel in an outdoor appliance. The result will inevitably be deaths and injuries from fires and carbon monoxide poisoning (among others) that will lead to costly litigation against the NYSDEC and the State. Does the NYSDEC or New York State really want to subject our citizens to the risk of death? And does the NYSDEC really want to subject our State to the cost of inevitable lawsuits resulting from such deaths? The State Consists of Largely Rural Areas Where OWB Do Not Impact Anyone. Broad Regulation of OWB Throughout the Entire State Would Be Overly Burdensome to Citizens In Most Areas of the State. Therefore, Any Necessary Regulation Should Be Established at the Local Municipal Level in Densely Populated Areas Only. In conclusion, the State consists primarily of heavily-wooded, rural areas. It makes no sense to burden the citizens of our entire State with a rule that really only applies to densely populated areas that constitute a tiny portion of the State. Any needed regulation should be left to local municipalities. Accordingly, we recommend that the NYSDEC NOT adopt the proposed, or any regulation of OWB. Such regulations can be easily managed by local municipalities of densely populated areas.